MEXICO CITY, Jan 22 2014 (IPS) - As the North American Free Trade Agreement (NAFTA) passes its 20-year milestone, Mexico is seeing the displacement of traditional crops like maize by marihuana and opium poppy as a result of falling prices for the country’s most important agricultural product. After NAFTA came into force between Canada, the United States and Mexico in January 1994, prices of maize and other agricultural products began to tumble, hurting the incomes of the smallest farmers who became the target of drug trafficking mafias. “This has happened in regions where there are poor farmers, where prices have collapsed and productivity is low. They have to resort to drug traffickers for loans or to rent land,” said Víctor Quintana, an adviser to the Frente Democrático Campesino (Peasant’s Democratic Front) in the northern state of Chihuahua. Quintana told IPS about the Pima native people who live in Chihuahua and the adjacent state of Sonora, who he says have become suppliers of raw materials to drug trafficking cartels engaged in violent disputes over distribution routes to the lucrative U.S. market. “The process started in the 1980s, but has increased since 2006 with penetration by the Sinaloa and Juárez cartels,” he said about the battle between the two drug mafias for control of the border region. 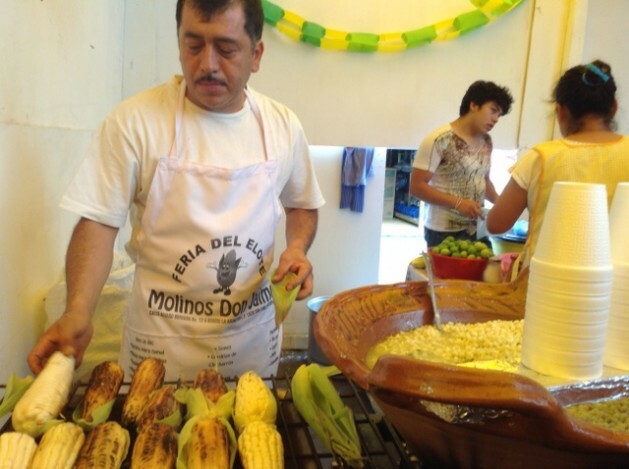 Maize is especially symbolic in Mexico, regarded as its place of origin. With 59 native strains and 209 varieties, it is an essential part of the population’s diet. Mexico produces 22 million tonnes of maize annually, but has to import a further 10 million tonnes to meet demand, according to the agriculture ministry and producers’ associations. Some three million farmers grow maize on about eight million hectares. Two-thirds of them grow it for family consumption only. In his view, declining income from maize farming is the reason why the country has become one of the foremost producers of marijuana and opium poppies. García Ponce, Oeindrila Dube and Kevin Thom of the University of New York published a study in August 2013 titled “From Maize to Haze: Agricultural Shocks and the Growth of the Mexican Drug Sector,” which concludes that lower prices increased the planting of illegal crops in municipalities more climatically suited to growing maize. The authors analysed data from more than 2,200 municipalities for the period 1990-2010 on production, agricultural employment and income. They also measured the impact of variations in maize prices on drug cultivation and pointed to the violent consequences of an expanding drug sector. The study emphasises that NAFTA forced liberalisation of maize trade, expanding import quotas and reducing tariffs, as well as precipitating a huge fall in maize prices in Mexico. Maize prices fell 59 percent between 1990 and 2005, leading to a 25 percent reduction in the incomes of maize farmers. At the same time, drug-related killings increased by an average of 62 percent in maize suitable municipalities, the study says. As a result of the 2007 global food crisis, maize prices increased by eight percent in the year to 2008, while drug-related homicides decreased by 12 percent in maize suitable municipalities. Drug seizures rose by 16 percent and eradication of drug crops by eight percent, in contrast with non-maize growing areas. Production of native maize in Mexico is also endangered by the threat of authorisation of commercial production of transgenic maize. “[Lower] maize prices contributed to the burgeoning drug trade in Mexico,” says the study, the first to identify the role of rural income shocks in the development of drug trafficking in Mexico. The study mapped areas of the states of Sinaloa, Guerrero, Michoacán, Chiapas, Oaxaca, Tamaulipas, Yucatán and Campeche, where there has been crop substitution. Drug crop eradication has been concentrated along the western and southern ranges of the Sierra Madre and adjacent coastal areas. Ministry of defence (SEDENA) figures indicate that marijuana eradication increased between 1990 and 2003 from 5,400 to 34,000 hectares, respectively, declining afterward to 17,900 hectares in 2010. Between December 2006 and November 2012, the six-year term served by conservative President Felipe Calderón, the armed forces destroyed 98,354 hectares, while in 2013, during the first year of conservative President Enrique Peña Nieto, 5,096 hectares were destroyed. Opium poppy eradication began with 5,950 hectares in 1990, rose to 20,200 hectares in 2005 and fell to 15,331 hectares in 2010. Between December 2006 and November 2012 the armed forces destroyed 86,428 hectares. In 2013, 14,419 hectares were eradicated. The subject of illegal crops is taboo in maize-growing areas. Although rumours abound that farmers are growing drugs hidden among their fields, no one openly admits to having anything to do with it. “You hear about a particular producer growing drugs, but people are afraid to talk about it,” farmers in the states of Jalisco and Guerrero told IPS on condition of anonymity for the sake of their safety. Since 2011 the Mexican media and the attorney general’s office announced that at least two small farmers had been arrested for growing drugs in the central states of Puebla and Guerrero. Peña Nieto announced a 26 billion dollar budget and “an extensive reform” for the country’s rural areas in 2014. But experts are doubtful whether these measures will change the situation of small farmers. “If they concentrate on a handful of states and do not change the structure of resource distribution, things will remain the same in the rural areas, and in particular, with drug cultivation,” Quintana said. On the other hand, “if idle lands are cultivated, if productivity is raised, and if technical support is provided for poor and indigenous small farmers, the problem could shrink,” said Quintana, who advocates a minimum guaranteed price for maize to counteract the dismantling of support for local production resulting from NAFTA. The study also concluded that the fall in maize prices has resulted in an increase of five percentage points in the probability of a drug cartel appearing in a municipality. IPS who owns you guys? It is a drug plain and simple and I have seen many lives destroyed by pot and it affects brain functions and can cause genetic defects! !As far as the medicine part ,if it is all You say it is make it a prescription drug! Yeah Dwain great idea and while you’re at it why not add tobacco,alcahol & coffee to the list.Wait better still,why not revive the Volstead Act & broaden its base to cover all those nasties that don’t have your approbation, After all,you blokes are the experts at f*****g ridiculous legislation.